I’m still in the thick of the flu so please forgive me if this post sounds a bit loopy. I’m literally writing it from bed in a Nyquil haze (which, let me tell you, is pretty awesome). I didn’t get around to uploading any desert pics yesterday, so I’m sharing this amazing recipe I followed for steamed mussels last weekend. 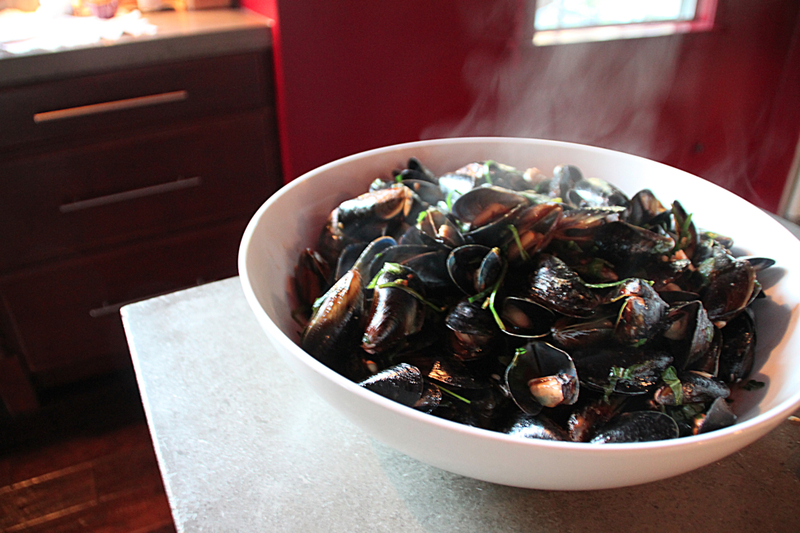 I have a thing for mussels (a “thing” is a total understatement), I could eat them all day…prepared any way. 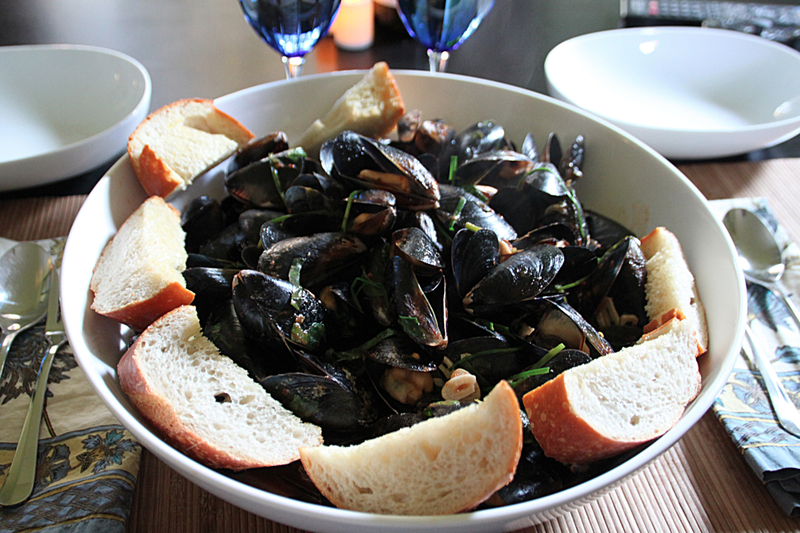 My favorite way to eat mussels, however, is steamed in a yummy broth and served with crispy bread for dipping. I never knew making mussels would be so easy. At restaurants, they seem so complex and expensive. We couldn’t have spent more than an hour (cleaning and debearding took up most of that hour) and maybe something like $25 making this meal. I followed this Epicurious recipe to a tee and found the spice to be a bit TOO spicy for me so if you want to tone that part down a bit, I would reduce the red pepper flakes by half. A nice kick is good but after a while, we couldn’t feel our lips and I’d say that’s bad. If I were to make this again (and I totally will) I may even omit the red pepper flakes all together but I wouldn’t want to deter anyone from trying the recipe as it was intended; overall, it was fabulous! Brush 1 teaspoon oil onto each slice of bread. Toast until brown and crisp. Rub both sides (one side if using baguette) with whole garlic. Cut bread in half on the diagonal. Heat remaining 2 tablespoon oil in a large skillet over medium-high heat. Cook sliced garlic, scallions and salt, stirring occasionally, until scallions and garlic color slightly, about 5 minutes. 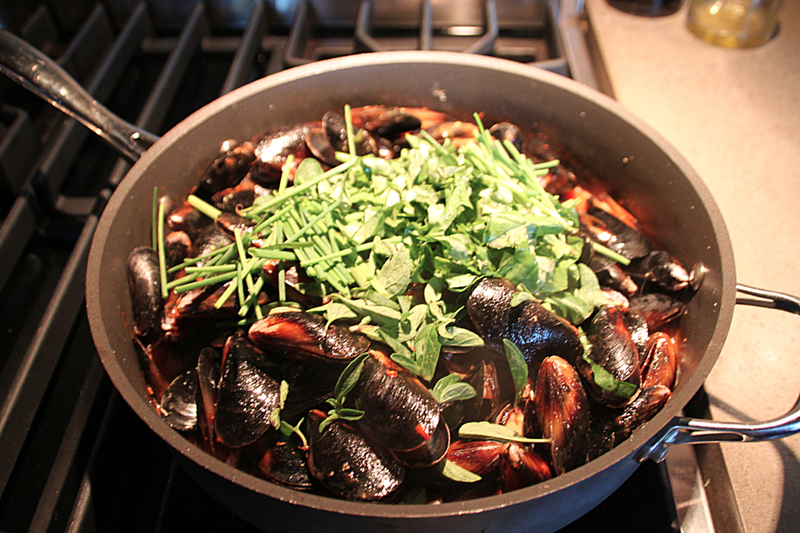 Add mussels, tomato puree, wine and pepper flakes. Bring to a boil. 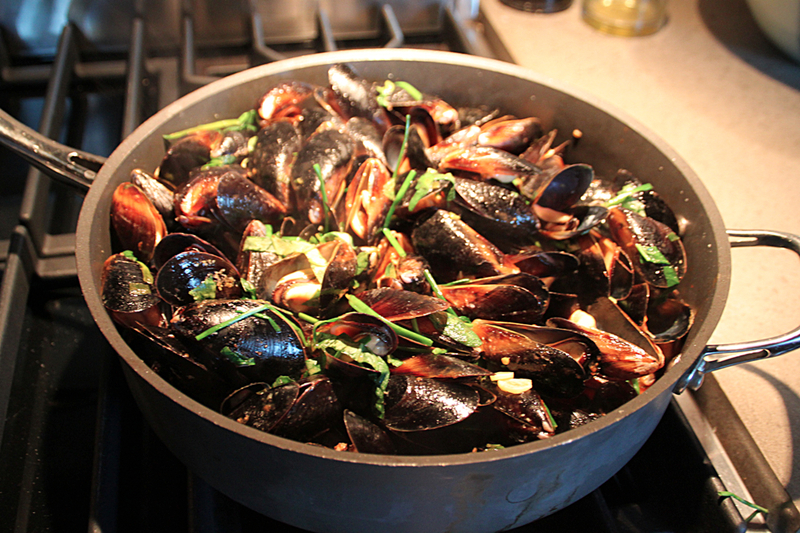 Reduce heat to medium, cover and cook until mussels open, 1 to 2 minutes. (I found that my mussels needed more time than this to open so don’t worry if you need more than 1-2 minutes for your mussels to open) (Discard any mussels that don’t open.) Uncover pan and add herbs; toss to combine. 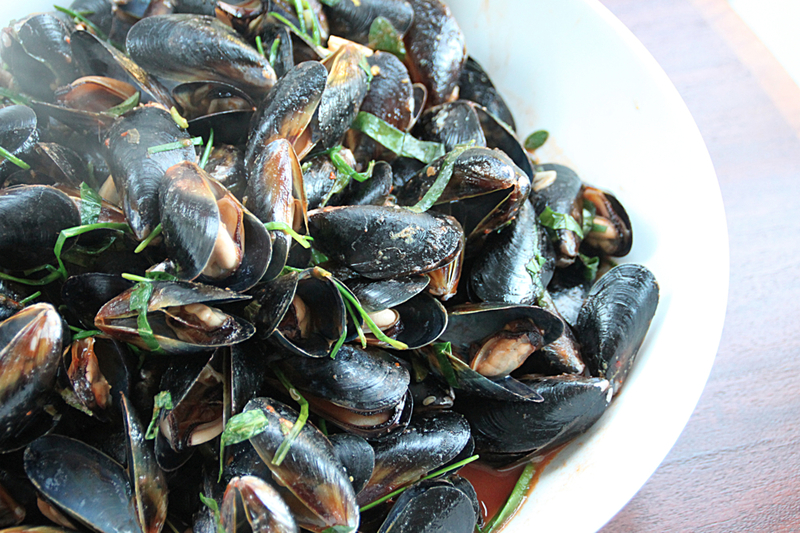 Divide mussels evenly among 4 bowls and spoon broth over them. Serve each with toast. Make sure you have a couple of discard bowls for your shells. We ate ours just like you see it but a nice cold, crisp salad would make a great addition to this meal. Enjoy! This looks wonderful, I have never tried fixing mussels but I love them. My husband has been asking me to make him a crawfish boil. Do you have recipe ideas for crawfish??? I have to keep it healthy and low sodium, I am finally getting to were I can revise some ingredients to work around the low salt. Mmmmmm, a crawfish boil sounds amazing. My husband’s family on his dad’s side is from Maine and every summer they have a lobster boil and serve all of the lobster directly on the table. I’ve only seen pictures but one of these days I hope to be there in person to experience it for myself. I, unfortunately, don’t have any good low sodium recipe’s for you. Epicurious.com is generally my go-to website for all recipe’s so I found this for you: http://www.epicurious.com/recipes/food/views/Old-Fashioned-Crawfish-Boil-105854. Although, it calls for a whopping 1/4 cup of salt!!! I’m sure that’s not what you’re looking for but if you’re good at substituting, maybe you can turn this recipe into a low sodium one to work for you. Good luck! I’d love to know what you come up with! I am not sure how to substitute both the packages of crab boil and the salt. I will let you know when I find something. Thank you for looking and sending me the link !!!!!!!!!!!!!!! By the way a trip to Maine might be in order, Lobster is my all time favorite food. I am pathetic, my favorites are Lobster, Dark Chocolate and Butter…I am a lost cause. Well at least the lobster and butter go together and dark chocolate for desert, yea that works for me !